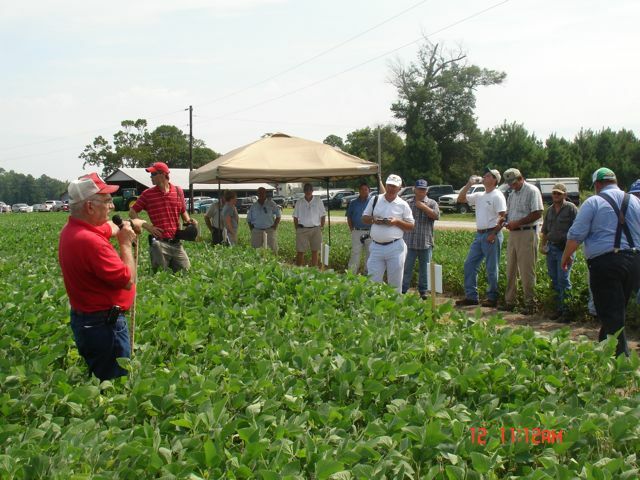 Site selection: Several insect and pathogen pests build-up if soybeans are not rotated, therefore, rotation helps insure reduced pest levels and improved crop health. Sites that have limiting pest, physical, or soil chemical problems should be avoided if these problems cannot be corrected. Early planting: Planting before May 20 usually insures that few late season caterpillars will develop in the field, however, some early planted fields may be more attractive to thrips and bean leaf beetle, which are minor pests, and occasionally stink bugs. Fertility and pH maintenance: Thin and short stands often have more corn earworms, but good growth reduces attractiveness and enhances the plant’s ability to compensate for damage. Reducing plant stress from low pH, poor fertility, or inadequate moisture will enable plants to tolerate insect feeding to a high degree. Variety selection: If planted early, maturity Group V and earlier maturing varieties will bloom and harden-off before the corn earworm moth flight and, therefore, will be unsuitable for infestation. Also, early maturity can greatly reduce soybean looper, velvetbean caterpillar, and late stink bug infestations; in rare situations stink bugs can be trap cropped by early maturity fields. Narrow rows (21″ or less): A complete canopy allows a higher level of biological control by insect predators, parasites, and diseases. Also, narrow-row soybeans seem to be less attractive to egg laying corn earworm moths. Avoiding unwarranted insecticide use: Both foliar sprays and Temik used at-planting may reduce the build-up of beneficial insects and lead to more severe later season caterpillar infestations. Early season insect pests rarely require insecticide and, if used, may produce more negative consequence by removing predators and parasites than benefits from insect control. In areas that have soybean looper and velvetbean caterpillar, spraying for corn earworm or stink bug may lead to high infestation by these later season pests. Therefore, avoiding unwarranted corn earworm treatments will tend to reduce other late season caterpillar numbers. Also, insecticide intended for corn earworm but applied too early can cause a severe corn earworm infestation. If early season (before corn earworm) spraying is necessary, a low rate of a carbamate insecticide (Sevin, Larvin, or Lannate) will cause the least disruption to the important bug predators and will usually reduce beetles or worms to below threshold if properly timed and applied. • What Is Eating My Tomato Plant?